What factors influence the acquisition of allomorphs? Most allomorphs are phonological variant forms of morphemes and stem from the phonological characteristics of the noun or verb. Earlier studies have found variability in the acquisition of allomorphs and various explanations have been given for this. However, a multifactorial understanding that brings together and clarifies the relationships between these explanations is still missing. 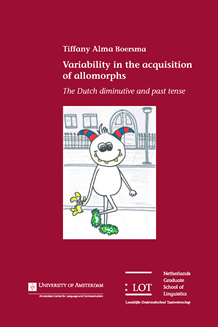 In four studies the development of the Dutch past tense and diminutive allomorphs are investigated in adults, typically developing children, and children with reading difficulties using a production and judgement task. Associations between children’s sensitivity to allomorphy and complexity of the phonological characteristics of the stem, children’s phonological processing skills, type and phonotactic frequencies of the (stem+) allomorph, and children’s vocabulary size are investigated. Type frequency and vocabulary size certainly play a role in the sense that children need enough input to be able to abstract the morphophonological patterns based on the phonological characteristics of the stem. However, children need to be able to deal with these phonological characteristics before they can actually generalize over the different morphophonological patterns. Children’s phonological processing skills and the complexity of the phonological stem characteristics appear therefore to have a stronger influence and to be more direct causes of the protracted acquisition of some allomorphs. The better children’s phonological processing skills and the less complex the phonological characteristics, the better children will be able to abstract the phonological patterns and choose the appropriate allomorph.